'Face to Face' is a film that aspires to be a thriller, and with its short running time of a couple of hours and a few odd minutes more, it really had to get its steps right, if things were to go well. The three odd songs that are hence jam-packed into the narrative look quite pointless; especially the second one that looks and sounds weird. Brushing apart the songs, you brace yourself for the thrills and chills that would hopefully follow, but they sadly never make an appearance. The twist and the surprise-on-your-face moments are nowhere to be seen, and before long you realize that this isn't the film you have expected it to be - an edge-of-the-seat thriller. The climax of the film in particular is unbelievable, not because of the incredulity that is associated with the events, but because of the shabbiness in writing. When the kids start bawling about their apathetic parents who have been away from home for a long while or the sadistic dad who flings dinner plates at their mom, you cringe in your seats, simply because all this made material for films decades back. To lend the new generation feel, Vinu does make them utter Facebook once in a while, and it's the social networking website that has apparently brought the three of them together. Balachandran is not one to be left behind either, and it's FB that plays savior to the officer, when it comes to cracking down a few vital questions in the story. Alas, Facebook cannot salvage a film that is neck deep wading through muddy waters. Mammooty himself has played this erratic husband who has lost his family and life to alchohol to perfection in Siby Malayil's 'Sagaram Sakshi' years back. The desperate woman leaves him for good, and walks away with their kid as is usually the case. 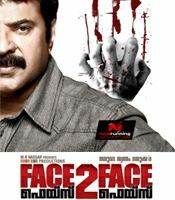 'Face to Face' has a stunningly good looking Mammootty, though regrettably, the actor has nothing much to do in the film than look good. Roma and Ragini Dwivedi are seen in blink-and-you-will-miss-them roles, while the four kids, especially Binoy Nambala, have done really good. But it remains that 'Face to Face' is not a film that banks on the performances of its actors.